Last last weekend took me to Erin Courtney’s The Service Road directed by Meghan Finn in an Adhesive Theater Project production at the New York City College of Technology’s Voorhees Theater. Like a rude person, I was 15 minutes late. The play is set in Prospect Park. How close and weird I felt for its familiar palimpsestic setting. Adhesive’s Executive Director Kalle Macrides plays our nature guide protagonist Lia who gives bird tours along the park’s service road until a storm strikes. Initially inspired by the 2010 Brooklyn/Queens tornadoes, the questions of disaster and recovery at the heart of this historical fiction have taken on more immediate resonances post-Sandy. As a kind of internal conflict externalized onto weather, the storm brings loss and repression along with felled branches and exploding park toilets to the stage. The staging is magic. Finn and co. immerse us in an inter-medial nature trip to forgiveness. A deluge of atmospheric video backdrops the action. One decaying-ly whimsical stop-motion animation by Courtney and Moodey shows Lia cleaning the erupting park bathrooms’ “fountain of crap” with a fire hose (after the Augean Stables). Live foley work from Mark Bruckner and Moodey sonically drench the environment with birdcalls, provocatively redundant Genie lift noise, and song(s) ethereally crooned and belted by Moodey (surprise heir apparent to Karen O). Einbinder’s “Tree Man” rides the Genie Lift, entering and exiting stage left as if a character in a video game or children’s TV (always in the same place). The lift, that undisguised theater fixture, collapses the world of the play with the grammar of the Theater through its peek-a-boo presence. Comparing horticulturalist and stage technician: theater as park? Another place-based character is unexpected romantic foil Linus, a “Carousel Man,” who posits beauty (or play) as its own kind of service. A host of students in the school’s Entertainment Technology department worked on the show, among them, senior Erin Grabe who built a carousel after Prospect Park’s own ride, rendered here as a one-person bike/light-up umbrella complete with warning bell. A dark joint-y tree frames the scene. Its click-clack branches claw through the proscenium arch and let perch a nest of egg-y projection surfaces: the talking-head “Chorus of Tree Children.” Recalling Richard Maxwell’s Ads and the work of Tony Oursler, these sculptural video faces loom an impish conscience into the myth of Lia. The fates-like trio reflects extroverted concern back onto our heroine, teasing out her wounds of shame and anxiety through the voices of ghostly youth. With the assistance of Natalia de Campos, Einbinder has designed two gorgeously haunting puppets. 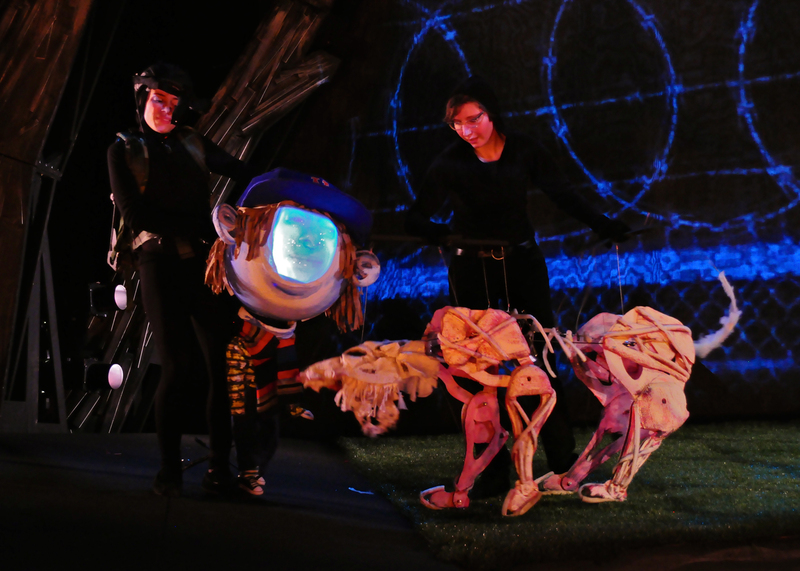 Quintuple-threat Moodey performs Ghost Dog, a gently fearsome canine skeleton while Caroline Tamas plays Big Headed Toddler, a ground-breaking-ly interactive marionette. A camera in Tamas’ headset live-streams her face onto the Toddler’s big head to radically inscribe puppeteer into puppet, scrambling perception and performance as to redefine the art form. Encore! Kind of SPOILING the drama now, Lia is directed to tell and re-tell the story of her brother’s death suggesting a theatrically iterative quality to memory, trauma, language, confession. I felt moved by that. Her whole emotional journey. Theater’s perpetual failure to imitate life accumulates along unexpected and lingering currents here. What a sad and surprising road these time-based service workers lead us down. The Service Road continues through Saturday February 2nd.